Our parties/events provide a great time for the kids and easy for organizers. The parties include ninety minutes to two hours of instruction and play for children 7 through 14. We will supply all the equipment needed for the activities, such as laptops, Minecraft sever, rotuer, Lego robots, Lego bricks/minifigs, projector and props – you just provide the kids! We can either come to your location, or you can come to our location in Mount Kisco. Our uniquely talented instructors know exactly what to do to ensure your guests receive the skills they need while having a fantastic time. Not only will your guests leave with a smile on their faces, but also with a load of new knowledge in their brains. Click HERE to download a copy of our activity description. Click HERE to access our online event registration form. We offer 3 different themes. Choose any one of our themes below. Invite Computer Adventures and we will show up with all of our LEGO® Mindstorms NXT robot pals! During the party, you and your friends will program and customize your robots to battle head to head on our Sumo Battle board. CAUTION: Robot battles can be exciting and inspiring. Be prepared for an extraordinary amount of screaming and laughter! Recommended ages 6 through 14. For children 6 & 7 years old, 90-minute party is recommended. For children younger than 5 years old, an adult/teenage assistant is needed for each child. Lights…Camera…Action! This party/event will have the kids’ LEGO® characters come to life. Using stop-motion animation and digital editing, students produce LEGO® brickfilms much like the ones viewed on YouTube. At the end of the party, we will have a “Movie Premiere” showing off all the movies that the children made. The host will get an Internet link to download kids’ movies. CAUTION: The next young “Steven Spielberg” or “George Lucas” may be in our midst! Recommended ages 7 through 14. For children younger than 7 years old, an adult/teenage assistance is recommended for each child. You and your friends will work together to create a Minecraft Adventure Map! Our instructor will guide you with a story theme, and the map creation process. When the map is done, you will play with your Minecraft creation. We will provide a server, router, projector, and every child with a laptop, which is connected through our local network without access to the Internet. It’s safe, fun, and exciting! 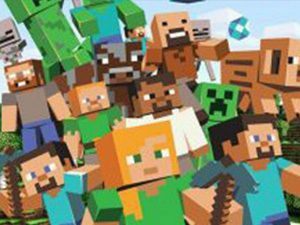 The host will get an internet link to download the Minecraft map; the children can keep on playing with their Minecraft Adventure Map. Recommended ages 8 through 14.